Yesterday I voted against Senate Bill 138, the Governor’s proposed Liquefied Natural Gas Pipeline Project. My vote against SB 138 was not a vote against a natural gas pipeline. Like most Alaskans, I support the construction of a pipeline to get our natural gas to market. My vote was a statement against the fiscal structure in the bill and the misalignment for the state. I’m encouraged that we’re closer to the reality of a gas pipeline than we’ve ever been because of the alignment of interests between ExxonMobil, BP and ConocoPhillips. But my objection comes from the fact that the state’s interests as a sovereign are not in alignment with the inclusion of TransCanada owning the state’s share of the pipeline and gas treatment plant. Beyond any doubt, this gasline will be the largest financial commitment in the history of the state. There are many troubling risks to the state from this megaproject including: low gas prices due to a potential oversupply from competing international projects under development; the state’s lack of expertise and ability to market its share of the gas received in lieu of royalties and taxes; and handing over the state’s ownership share of the pipeline and gas treatment plant to TransCanada. The last point is what gives me the most indigestion. Make no mistake; the producing companies (ExxonMobil, BP, and ConocoPhillips) and not the state are in control of moving this pipeline project forward. TransCanada is a pipeline company but who actually builds this pipeline will be decided by ExxonMobil with concurrence from BP and ConocoPhillips. TransCanada is simply acting as our lender to cover the upfront project costs at a guaranteed rate of return through construction. The deal looks like this: TransCanada will hold an ownership interest in the gas treatment plant and the pipeline equal to the state’s estimated 25% share of the gas; the state would have a one-time option to buy back up to a 40% of its ownership interest from TransCanada so long as TransCanada’s share doesn’t fall below 14% leaving the state with only an 11% ownership interest. Furthermore, regardless of whether the state exercises its option to buy an ownership interest from TransCanada, we are obligated to pay TransCanada’s development costs plus an interest rate of 7.1% if the project is not sanctioned. The state entered into an agreement like this with TransCanada once before when the legislature passed the Alaska Gasline Inducement Act (AGIA) in 2007. That law guaranteed the state would reimburse TransCanada up to $500 million for costs incurred related to the development of a large diameter gas pipeline through Canada. Today, most legislators would agree that tying ourselves to TransCanada through AGIA was a mistake. I’m concerned that we didn’t learn our lesson and we’re making the same mistake again but instead of a $500 million mistake, this could turn out to be a multi-billion dollar mistake. I’m uncomfortable supporting this proposed commercial arrangement that doesn’t align the state’s interests with ExxonMobil, BP and ConocoPhillips. These companies will see to it that this project is profitable for them or they won’t proceed. Similarly, TransCanada is guaranteed to make a handsome profit. Unfortunately it looks to me like the state of Alaska as a sovereign and the owner of the oil and gas resource is assuming the most exposure and risk. Making a bad situation worse, reduced revenue from oil taxes will result in year after year deficit spending to balance our budget, depleting our savings accounts around the same time pipeline construction will begin. A sole source, non-competitive bid resulting in a multi-generational contract with TransCanada is not in the state’s best interest. In my opinion, the Legislature should put SB 138 on the shelf and work on it over the interim. We have the time and the obligation to do it right. Since my last newsletter, I have introduced three new bills in the legislature. On February 5th, I introduced Senate Bill 159 regarding the AirCare membership program. Since January 2009, Airlift Northwest, the Seattle based provider of lifesaving air medical transport services, has offered the popular AirCare membership program to residents of Southeast Alaska. Approximately 2,000 Southeast households are enrolled in the program. Air medical transportation is expensive and insurance may not cover all the costs. The purpose of the AirCare program is to cover all out-of-pocket expenses such as deductibles and coinsurance amounts that may not be covered by the primary payer. As an AirCare member, only your insurance company receives a bill. Airlift Northwest is secondary to all payers and works directly with your insurance company for claims processing. The AirCare program directly helps fund Airlift Northwest so they can transport critically ill or injured patients to hospitals with levels of care not locally available. Since its inception, the AirCare program was offered to Alaskans under a regulatory exemption it received from the Alaska Division of Insurance. However, after an organizational restructuring, the Division of Insurance deemed the program no longer exempt from insurance regulation as stated in AS 21.87.010 under which Airlift Northwest was providing the program. As a result, the Division of Insurance ordered Airlift Northwest to cease enrolling new members. Airlift Northwest is allowed to honor their existing memberships but is not allowed to renew expired memberships. If Airlift Northwest wants to continue offering the AirCare program, then the program must either be fully insured by a health insurer authorized by Alaska or Airlift Northwest must obtain a certificate of authority pursuant to AS 21.09 to transact health insurance in Alaska. Since Airlift Northwest operates under the umbrella of University of Washington’s medical system, becoming a licensed insurer in Alaska is not an option for them. Senate Bill 159 will exempt air ambulance services from the state’s insurance code, thereby allowing Airlift Northwest to continue offering the AirCare program to Alaskans. The bill passed the Senate unanimously on February 28th and is now in the House Labor and Commerce Committee where it received its first hearing on March 17th. The second bill I introduced is Senate Bill 192 which proposes to amend deficiencies in Alaska’s petroleum production tax. The current tax structure, created by the passage of Senate Bill 21 last year, sets a base tax rate of 35% based on a net profit system which is calculated after deducting the cost of royalties, transportation, operating and capital expenses. The producers also receive a tax credit between $1 and $8 paid for each barrel of oil produced. The per barrel tax credit is not contingent on any performance measures. The producers are not required to do anything to receive this credit except pump oil from their existing wells. There is no requirement for expansion, exploration, increased production or capital investment in Alaska. The state is obligated to pay this credit to the producers on a sliding scale which increases as the price of oil decreases. For example, if the price of oil is between $140 – $150, the producers receive a tax credit of $1 per barrel. But if the price of oil falls to under $80, the producers receive a tax credit of $8 per barrel. In FY15, the impact to the state treasury as a result of this per barrel tax credit is estimated to be almost one billion dollars. Senate Bill 192 would reduce that per barrel credit by half so it would start at 50 cents per barrel at high oil prices and cap out at $4 per barrel at low oil prices. This would return almost a half a billion dollars to the state treasury in FY15. Under the current tax regime, the compensation for the value of Alaska’s hydrocarbons is too low compared to similar world class hydrocarbon basins around the world. Senate Bill 192 would also raise the minimum production tax from 4% of the gross value at the point of production to 15%. As the price of oil goes down and the credits go up, we need a higher minimum tax to protect the state’s share of its resource wealth from our legacy fields on the North Slope. Senate Bill 192 would establish a more reasonable, balanced and sustainable petroleum production tax for Alaskans. The bill was referred to the Senate Resources Committee where I have requested it be scheduled for a hearing. Finally, the third bill I recently introduced is Senate Bill 201 regarding criminal trespass. As a landowner, you have the right to regulate activities on your property. However, in Alaska, current state law gives a person the privilege to enter and remain on unimproved or apparently unused land that isn’t posted with “no trespassing” signs. Furthermore, a sign must be placed at each roadway or access point onto the property. Many Alaskans own private property in remote locations with inclement weather. No trespassing signs can be blown down, removed by vandals, or covered by snow. The lack of visible signage should not absolve trespassers of guilt. Senate Bill 201 would repeal Alaska Statute 11.46.350(b) and (c), thereby removing the requirement that private property be posted in order for criminal trespass laws to be enforced. It should be the responsibility of the individual to know who owns the property that they want to access. Today’s technology allows many options for individuals to identify public and private property boundaries such as topo maps that can be downloaded on a smart phone or GPS. In addition, the public can access maps showing property boundaries from the state Department of Natural Resources, the U.S. Geological Survey, as well as municipal plats available at city hall. The Energy Council Meets in Washington D.C.
During the first week of March, I traveled to Washington D.C. to participate in the Energy Council’s 2014 Federal Energy and Environmental Matters Conference. This year, the Council met jointly with the leadership of the Interstate Oil and Gas Compact Commission. The impressive line-up of presenters included: Tommy Beaudreau, Assistant Secretary of the U.S. Department of Interior; Tony Clark, Commissioner of the Federal Energy Regulatory Commission; Charles Drevna, President of American Fuel and Petrochemical Manufacturers; Adam Sieminski, Administrator of the U.S. Energy Information Administration; and John Novak, Senior Director for Environmental Issues at the National Rural Electric Cooperative Association. In addition to the presenters, the Council discussed numerous issues of importance including: North American grid investment needs; Mexico’s transitioning energy policy; North American liquefied natural gas exports; fossil energy research; climate change regulations; and advanced coal technologies. Once again, my sincere thanks to Ms. Lori Cameron, the Energy Council’s Executive Director, for organizing a very informative and successful conference. 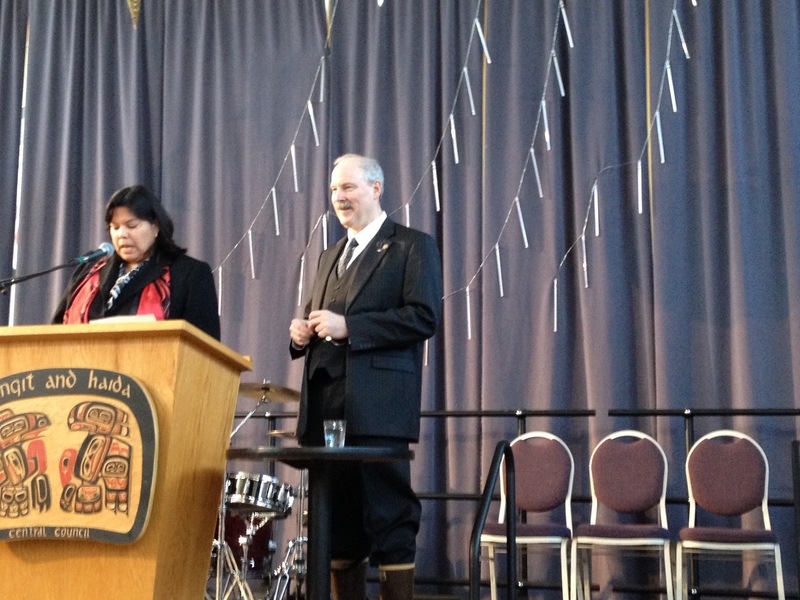 I was pleased to be invited by the Tlingit and Haida Central Council to speak at the Native Issues Forum on February 19th. I talked about various issues of interest to the Council including updates on two of my bills: Senate Bill 60 regarding sea otter management and Senate Concurrent Resolution 2 regarding the Tongass National Forest. As for Senate Bill 60, my office is working on revisions to this bill. Instead of placing a bounty on sea otters, I’m proposing the state should file a lawsuit against the U.S. Fish and Wildlife Service (USFWS) to return Southeast sea otters to state management. The USFWS hasn’t updated their management plan in 20 years. The population of sea otters has changed dramatically in that time. There is no reason for Southeast sea otters to be protected by the Marine Mammal Protection Act because they are no longer endangered or threatened. Also, I am working with various native groups in Southeast to increase opportunities for marketing of quality sea otter products. Also that same week, Sealaska Heritage Institute (SHI) held a Lunch and Learn for legislators and their staff regarding their sea otter fur industry. Sea otter fur is the finest in the world, and SHI is working to open new markets for this luxurious product. It has significant economic potential for native craftspeople here in Southeast. I also gave the Central Council an update on Senate Concurrent Resolution (SCR) 2. With the assistance and recommendations from the Department of Natural Resources, a Committee Substitute was adopted by the Senate Judiciary Committee reflecting a few changes. One of the main revisions is urging the United States Congress to act on the request of the governor to acquire additional state land in the Tongass National Forest from the United States government by purchase or negotiation or by seeking amendments to the Alaska Statehood Act. Other changes in the Committee Substitute were for housekeeping purposes only. The revised Resolution passed out of the Senate Judiciary Committee and is presently waiting to be calendared on the Senate Floor for a vote. My final comments at the Native Issues Forum were on the need for regional collaboration among Southeast communities. I represent 27 communities in Senate District Q and most of them are small villages. I believe it’s important for the Mayors in Southeast to work with me on identifying our basic community needs and regional priorities. After the legislature cut oil taxes last year, we have less revenue for future capital budgets. In order to take care of the basic needs in our communities, we need to work together to agree on the region’s highest priorities where state dollars should be allocated. The Southeast Conference held their annual mid-session summit in Juneau from March 12th-14th. 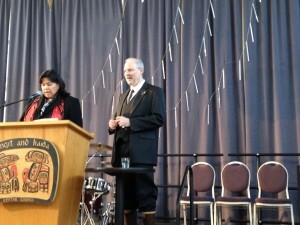 I spoke to the Conference on March 13th and addressed various issues in front of the legislature this session. I gave updates on the Gasline bill, education funding, the need for an equity infusion to reduce the unfunded liability in the state’s retirement system, and loan programs for Southeast through the Alaska Industrial Development and Export Authority. 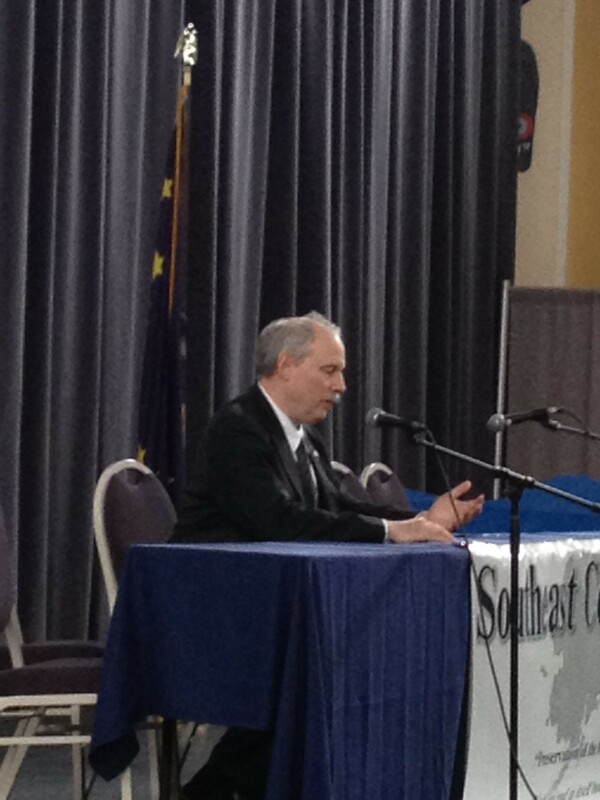 I also talked at length about my concern regarding the Alaska Marine Highway System. We need to continue setting money aside to replace our aging fleet, starting with the Tustumena. There is currently $40 million in the marine highway vessel replacement fund but needs an additional $100 million to replace the Tustumena. We also need to ensure that our ships are constructed in the Ketchikan shipyard, not Louisiana. I always enjoy it when the Southeast Conference comes to Juneau during the session. It’s a great opportunity for me to speak to community leaders from all over Southeast and listen to their concerns.